Today I got 2 packs of tea from Tesco for 75p each! 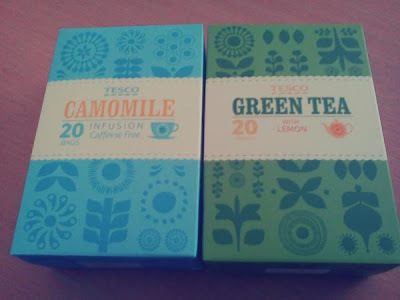 I didn't like the peppermint green tea I once bought so I hope this is different but the camomile one smells really bad so I am worried. Hopefully I shall like them both. This was a really boring post. You should try strawberry tea, it's amazing!!! ooh I might get some the next time I go to tesco!